Title: cross the road to a Honda. Owning a Honda was and still is the best investment a person could make. Standard maintenance-oil, other fluids, battery and tires. Still very good gas mileage especially being 16 yrs. old. Very reliable only 1 time not starting-needed new battery. I have a regular door to open up the back-love this feature because hatchback hydraulics break easy. Completely safe in car - was hit from behind (not bad), but airbags on front and side deployed immediately and I had no injuries at all. Not even a scratch. Still comfy including adjustable back for driver's seat and all features still work. I especially like the hidden drawer under front passenger seat. Also various hidden and lockable compartments for valuables. Paint color still looking good (use hair conditioner not car wax sits on top of paint, hair conditioner conditions paint and keeps it from fading). Another great value are the shocks. They are the original ones and the price to replace them is quite high. The brakes are another great feature-they still work like they were brand new. The value of a Honda does not drop dramatically like all the other vehicle makes when driven off the car lot. When I go to trade it in I will get a higher trade-in value than most other vehicle makes. Old saying: "if you can't afford a Mercedes - buy a Honda". I know definitely my next car will be none other than a Honda. I'd like to get the Accord touring sedan. No regrets. No regrets at all! It has all features you would need in a compact economical car. Honda CR-V is a very reliable and low cost running vehicle. Its is spacious and a lot of space in the storage as well. It is a compact car/van. It does good mileage - that is the reason a lot of these vehicles are sold yearly. It is very easy to maneuver this vehicle in and out of parking lots and driveways. The seats are made of leather so that adds comfort while driving. It has sun/ moonroof so during the summer it great and a night. It amazing to drive with the roof open. The interior is grey and black and the exterior is silver so the colors go well together. It comes preinstalled with 6 CD player /radio, alarm system and a lot of small compartments for storage. It is a four door car so traveling with family and friends is very easy. The wheels are 4 wheel drive and this is automatic so no need to switch it manually. It comes with airbags as well. . Finally this is a great car and I have had it for 16 years without any major issues. Scratched old gold Honda car in still good working condition. When you drive you can hear too much the noise from outside and the car itself makes a lot of noise that it is sometimes difficult to tell when the car is fine or it has a problem. The car will not raise its speed as it should normally. The car is old but durable. It is over 16 years old and while many parts have had to be replaced it takes me where I need to go everyday without problems. It is gold with a few scratches here or there in the car. It has gone through Harvey but it did not turn off even if it get flooded a bit in the car. The car was clean after the fact and the smell is gone. It has gone through two car accidents and got fixed from there. The wheel of the car is very easy to maneuver. In the last 6 years that I have owned the car, the car horn has barely been used. I have only used it about 4 times. The car has a CD player. 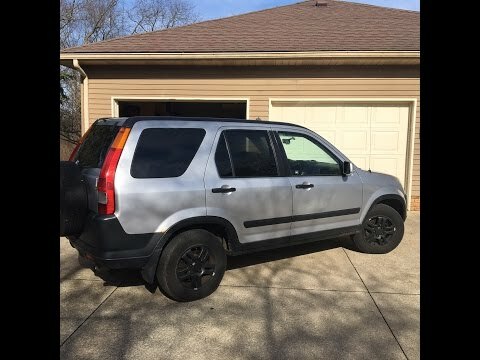 2002 Honda CR-V 2.4L VTEC 4-Cylinder Engine, Complete Review With Pros And Cons. 2002 Honda CRV 4X4 video overview and walk around.